Fishing is a very popular sport and having a good rod is very important and protecting your fishing rods is just as important. Having your fishing rods in a fishing rod storage rack is the best way to protect your fishing rods while not in use. Fishing rods can be expensive and most serious fishermen will have several rods to use for different types of fish. 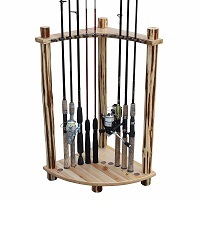 This one of a kind fishing rod rack holds all brands of fishing rods. The design is solid, light, and very stable. Fishing rod storage racks are available in several styles and can hold several fishing rods at a time. Featured below are the best fishing rod storage racks available to keep your favorite fishing rods protected and stored safely when not in use. 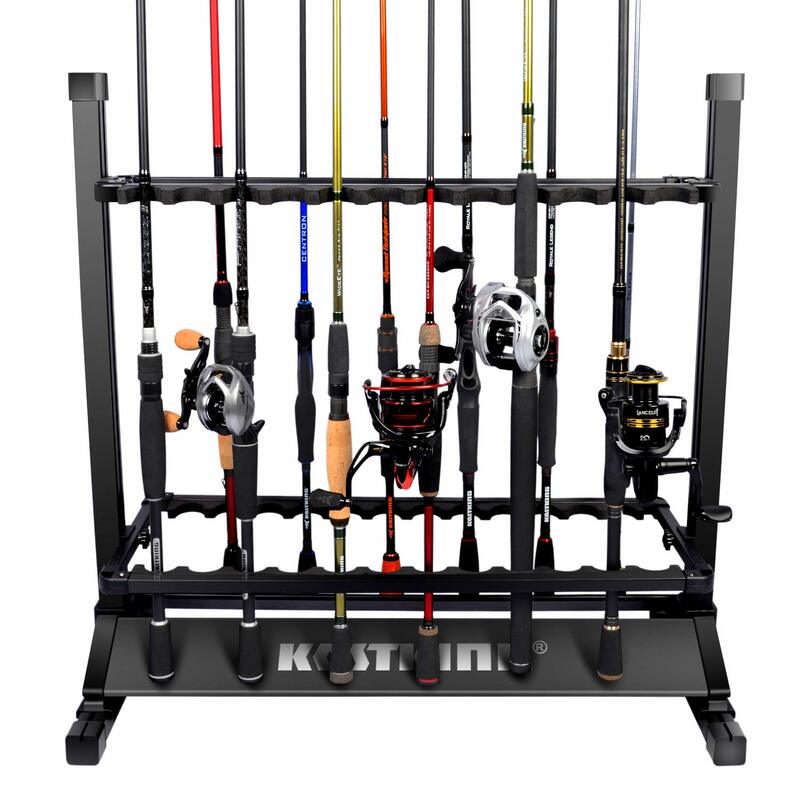 This specific Fishing Rod Storage Racks is the most popular with our readers. There are several things to think about when deciding on the best fishing rod storage rack. First, how much space do you have? Do you want to have your rods stood against a wall on a vertical rack so you can grab what you need easily? This might be a good idea if you fish a lot. If space is at a premium or you are seldom fishing, consider overhead storage. Many people keep their rods in the garage on a horizontal rack secured to the ceiling. This also keeps your rods out of the way of curious kids and pets. Many fishermen seem to accumulate a selection of rods. They will have fly rods, bait-casting rods, spinning, ultralight, wire-line, boat and surf rods, as well as all plenty more fishing tackle, and unless you have a huge shed, storage is going to take some planning. Even if you do have a big shed or room, you still need a better solution than simply propping the rods up against the wall. 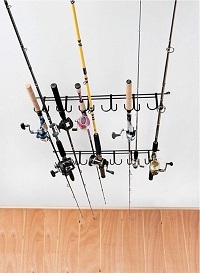 If your rods are shorter than ceiling height, you might want a rack for standing them up. If they are longer and do not separate into parts, keeping them horizontally on the ceiling is a better choice. Keeping them all in one place means you can admire your collection anytime you want. 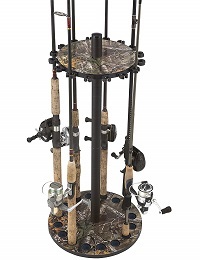 If you are looking for a rack for an active fisherman or for that person that never seems to have enough fishing poles to do the job this one has both beauty and functionality and the compactly to hold a large number of rod setups. It comes in an oak finish and is made of wood so it is more like a piece of fine furniture that will keep your cherished pole collection well stored and safe from the damage of being improperly stacked in the corner. So if you have invested in good rods, it is well worth a bit to keep them protected. Although the slots on this particular holder will probably be too tight for most surfcasting rods; they are an idea for your thinner bait-casting rods. The price is good, and the small openings are not a problem if you are looking for storage for graphite rods or some of your thinner rods. This rod rack is designed to minimize rod movement. The back of this rod holder is flat, so it needs to be mountains flush against a wall, not on the curved side of a boat. You could even mount it in an RV for quick, easy access to the rods. If you are looking for a simple, unfussy, durable rod holder, this one ticks all the boxes. It holds 4 rods, but the attractive price means you can invest in 2 or even 3 of these racks, to store more rods at once. 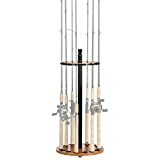 This attractive fishing rod rack will hold up to 8 rods. Although most fishermen start off with 1 or 2 rods, many seem to accumulate more over time, so this will hold them all in one convenient place. Perhaps 2 or 3 members of the family are into fishing, in which case 8 rods is not an unrealistic number, especially if they do different types of fishing. Made out of solid pine wood and finish. You do not need any tools to put this rack together. It screws together easily and will last for many years. The price is surprisingly low for such a useful and well-designed product. How Many Places Do You Need a Fishing Rod Storage Rack? Not only is it vital to protect your expensive fishing poles, but it is also a good idea to look at the reels and other equipment. Whether you are worried about your fishing rods getting damaged or bent to the point of no return, or frustrated that your baits have dried out, melted or rusted, there are simple guidelines you can follow to ensure the life of your valuable equipment can be prolonged. Take a look at what you already have and decide which items need to be replaced. You can often get discounted fishing equipment during the winter, so if there is anything you cannot fix or save, you can invest in new items and then learn how to take care of them. Cheaper rods do not require much maintenance before you store them, but more expensive ones do, especially those with natural cork handles and grips. When you get home from fishing, rinse your rods with fresh water and let them air-dry. If they have cork handles, apply cork wax to the handles. This type of wax, made primarily from lanolin which comes from sheep wool, is available from music stores. Look at the guides to make sure there are no scratches, cracks or nicks. Ensure there is no fraying and check they are securely attached to the rod. Make any minor fixes necessary. If you do not, then the next time you go fishing the nick might slice your line, then you can wave goodbye to your favorite lure. Although fishing reels tend to be one of the most expensive items a fisherman owns, they are often sadly neglected. You can leave a braided line on the reel over the winter, but it might become discolored from heavy use. Monofilament and fluorocarbon line should be removed and stored on a spool. If you choose not to do this, you will have a ‘line memory’ issue which is when the line gets curlier and coarser over the winter when it is stored on the reel, and it will not straighten out properly when you next go fishing. Once you have taken the crank handle off your reel and cleaned it out with a damp cloth, using compressed air to remove fine particles, you can use gun oil to lubricate the moving parts in the reel. Keep them in a zip-lock bag to keep dust and moisture out. So now your rods and reels are protected, look at the other tackle. Rinse hard baits with freshwater and organize them properly. Seal skirted or plastic ones in a sealed bag. Clean your waders with fresh water and dry them. Pack boot-waders with newspaper, then roll them up instead of folding them. Put them in a large bag and keep them somewhere dark and cool. If you are running out of space, then what about overhead storage for your fishing rods? This clear 3/8 inch acrylic storage rack keeps your rods out of the way yet easily accessible. You can ceiling-mount this in your garage or even in a motorhome or RV. Do you have your own fishing boat with a cabin? Store it in there for maximum convenience. This rack will hold 6 rods and reels. Boats usually have wooden fishing rod racks but if you want a cleaner, more contemporary look, then choose this clear acrylic model. It is strong, sturdy and will keep your rods safe. Although some fishing rods come in a protective bag for hanging them up, you can also store them flat if you want, somewhere above ground level. Some fishermen have rods all over the house while others have a space set aside to keep all their rods in one place. Even if your rods are in their own protective bags, you might still prefer to have them on display, which means you are going to need to purchase or make a rod holder of some description. If you plan to buy more rods in the future, you might want to get a rod holder with more spaces than you currently need. A lot of the planning, of course, depends on how much space you have available. The more rods you get, the more accessories you will also need. Perhaps you have a favorite lure, but over time you will find yourself buying new ones to try them out. Your significant other might turn a blind eye to the live bait she occasionally spots in the refrigerator but having fishing gear all over the place might not be ideal. First, figure out how much space you have available and then take a good look at how much fishing equipment you have and how much room you will need to keep it all in the same place. If you have a dry garage or shed, that might be the best place to keep the rods, or perhaps you have a utility room that would be a good fit. 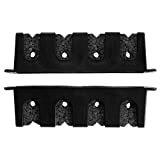 If you are short on space, you might want to have them in the corner of the living room, or even horizontally suspended against the garage ceiling. Some guys might want to keep them in the bedroom but unless you live alone, that idea might not be everyone’s idea of the best place to keep your beloved collection, especially if you want to maintain your marital bliss! Perhaps you only have a couple of rods which fold down into pieces and can be stored in the bags they came in, but if you have a good-sized collection, you will want to think about a better storage option. Although a custom rod rack might sound like the best option initially. Because everyone has their own collection of not only fishing rods but also other fishing tackle, reels, and fishing-related equipment, there are plenty of commercial ones available these days, so you will certainly be able to find the perfect rod storage system for you, regardless of how many rods you have and how much of a limited space you have.